In preparation for vacation, my best friend and I picked different BOTM books (each planning to pack two and swap two when we finished), which meant I got to read All Grown Up, Stranger in the Woods, and Marlena from last month's options. (I have Dead Letters around here still waiting for me, but haven't gotten to it yet...). I would recommend All Grown Up, though I didn't precisely enjoy it (coincidentally, I ended up reading The Middlesteins at the same time, which I did enjoy; I wrote about my own attempts to figure out why I loved one and not the other last week). Marlena sucked me in from the start; much like last summer's The Girls, I found it spoke to that universal "no one understands me but me" feeling of the teenage years, and the way those feelings can make some of us make decisions and act like people we may not be proud of as adults. Despite a few problematic sections, I mostly enjoyed Stranger in the Woods as a look at one of the last known hermits, a man who lived in the Maine woods for twenty-seven years before discovery. Full review to come here later on this week. BOTM aside, I also re-read Little Bee for book club (this book broke my heart both times), and stopped and started and stopped and started and eventually really liked Desperate Characters, a 1970s novel by Paula Fox (despite the characters being, unsurprisingly, truly desperate). And speaking of book clubs, did you join in for the group read of Enrique's Journey for the March Social Justice Book Club? That "run a 50k" thing is feeling more and more real by the week, and I'm more fully convinced that trail running is far more my jam than road running ever was or will be. Last week, we ran our longest training run of the season (22 miles turned 24.5 miles because we misjudged the length of the trail). 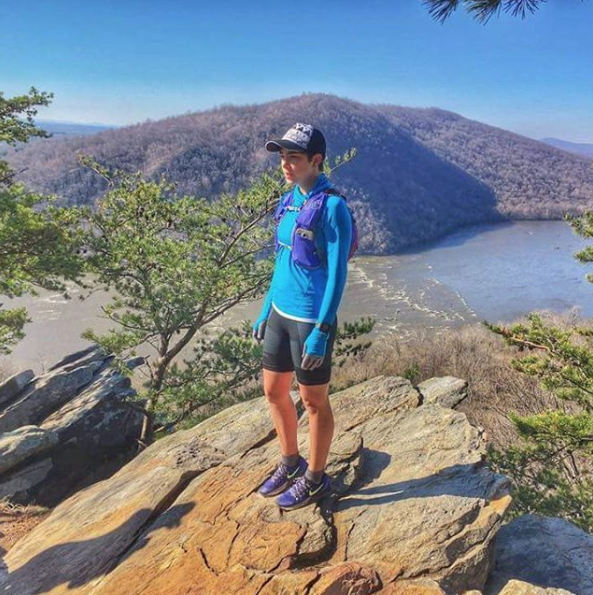 This weekend (while technically April...) was a back-to-back weekend, with 9 miles on the road and 16 miles on the Appalachian Trail (my first real foray into running the AT, despite living a mere 30 minutes from several entry points). It was exhausting, and absolutely worth every. single. step of elevation gain. My race is in less than a month. Let's do this thing. I also watched The Barkley Marathons this weekend, in part to jazz myself up for my own race (and to make myself feel less crazy, because 31 miles is nothing compared to what these guys are up against) and in part because the 2017 Barkley Marathons happened this weekend (I don't think anyone finished, though, right?). If you're even the least bit into endurance sports, trail running, and/or the crazy things people do with their spare time, this is well worth the 90 minutes. Get out your tissues, the New York Times is making us all cry this month. I know it's made quite the rounds already, but in case you missed it, Amy Krouse Rosenthal's article in the Relationships section was a beautiful, heartfelt tribute to love and loss written as she faced down a cancer sentence that took her life just ten days after this article was published. Seriously, not suitable for reading in public places: "You May Want to Marry My Husband." Continuing that trend, I've been a follower of Jen Miller's since her book, Running: A Love Story came out last year, and was so very sad to read that her much-loved dog, Emily, died earlier this year. Miller wrote about the experience, and the grief, of losing a pet with a poignancy that also made me cry (and hug my dog just a touch too tight for his comfort levels): "Things I Wish I Had Known When My Dog Died." Moving from tears to righteous outrage, Maureen Dowd's column in that same paper, "Donald, This I Will Tell You" was expertly done. If you'd like to know a little more about the EPA and US environmental law, two things in grave danger under the current administration, The Atlantic has a thorough piece in "How the U.S. Protects the Environment, From Nixon to Trump"
I wrote a thing about science books for us non-scientists. Got any recommendations to add? April is National Poetry Month; what will you be reading? The Social Justice Book Club is reading Headscarves and Hymens: Why the Middle East Needs a Sexual Revolution. Want to join us? Sign up here for an invite to the Social Justice Book Club Slack. Reviews of A Line Made by Walking by Sara Baume, The Boy in the Earth by Fuminori Nakamura, and The Teeth of the Comb & Other Stories by Osama Alamar will come in Shelf Awareness for Readers this month.